Lil Lex's Blog: Parking "enforcement"
I should have blogged about this much sooner, but I kept forgetting. Instant classic! When wifey was still pregnant, she had it pretty rough. Her feet had swelled up so much that she bought a pair of shoes one shoe-size larger than usual -- and they still didn't fit unless she had the laces untied, gangsta-style. She had back pains, and carpal tunnel in both of her wrists. Rough times, yo! She took comfort in little things, like being able to use the "parking for expecting mothers" spots at the mall. Sometimes the spots are labelled "parking for parents with child" or "parking for parents with small children", but we parked in those spots too, because pregnant moms deserve them just as much as mothers of newborns. They've got strollers! She's got swollen feet! First of all the grammar is off. "Infant's" is the possessive for "infant", not the plural, dummy! If you're going to punk me about being stupid, try not to look stupid in the process. Secondly, having a car seat in my car doesn't prove that I have an infant, it just proves that I have a car seat in my car. Lastly, there is no law that I'm aware of prohibiting people from parking in those spots. 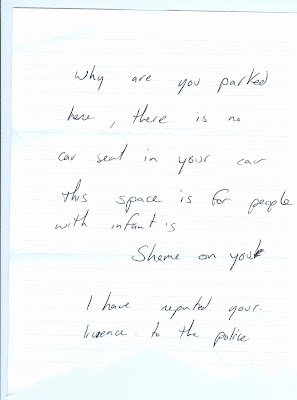 If jerks want to be jerks, let them be jerks, don't leave letters on their windshields! You run the risk of embarrassing yourself when a really pregnant woman walks out and reads your stupid note. Any of you have similar loser stories? c) the child WAS small - much smaller than that 4 year old brat with two perfectly useful legs. i dont think those spots are legal. its a courtesy done from the lot owner/mall etc. That's true, chin. Let's not throw around legal jargon if we don't have to. By the way chin, you won a contest on my blog. I'm giving up your prize unless you e-mail me in the next... 18 hours.